According to ADB, Asia faces an estimated US$460 billion infrastructure investment gap in projects ranging from toll roads and airports to telecommunications. Governments across the region are therefore eager to attract private sector participation, as evidenced by the establishment of government structures, such as Infrastructure Asia in Singapore. There is also a rising trend of corporates establishing their own infrastructure funds alongside established private equity fund managers who have been increasing their exposure to the sector. Amidst this backdrop, our panel of Asia-focused experts will discuss the best strategies to tap into investment opportunities in the region.Which countries have made the most progress in establishing an effective institutional framework to attract private sector participation? Which countries in Southeast Asia have seen the most private sector investment, and what strategies have their governments adopted to boost investor interest? From a corporate perspective, what are the opportunities and challenges to raising a first fund, and how can they compete in the market? What do international investors coming into the region need to be aware of when deciding when and where to invest? Renewable energy activity has continued to gain momentum in the region, bolstered by several big-ticket transactions. As the region’s demand for energy projects increases, infrastructure companies and investors have been pushing for more sustainable practices—namely transitioning away from oil and coal—as a long-term value-add proposition. However, with the market largely fragmented and country-specific, investors looking at the region need to consider which projects and platforms are best suited for their investment purposes. Our panel of specialists will share their insights into the latest projects, areas of investment, and strategies for accessing the market. Solar, wind, and other renewable energy sources; which areas should investors look to invest? Which are the most popular markets for renewables in Southeast Asia in 2019? Should investors use a developer-led approach or invest in projects with lower levels of risk, and what are the advantages and disadvantages of the different approaches? Given the rising demand for LNG infrastructure developments in Southeast Asia, what are the opportunities in this space for private investors? As Southeast Asian countries continue to rapidly urbanise, the need for technological advancements in infrastructure grows. Technologies such as autonomous vehicles, the rise of data centres, and innovative waste storage solutions have converged to create a ‘smarter’ infrastructure in cities. Moreover, as governments announce initiatives such as the Philippines’ ‘Build Build Build’ programme, there is an increasing realisation that huge investment opportunities exist in the projects driving these emerging technologies. In this session, our panel of experts will highlight current and future trends, and discuss how you can safeguard your investments to make them future-proof. Which sub sectors of the Southeast Asia infrastructure space are most likely to be disrupted? How can technology help close the infrastructure gap in Southeast Asia, and how can you ensure that your long term-investments are future ready? What are some examples of projects that have invested in technologies to help make infrastructure smarter? Why are tech companies moving their data centres to Southeast Asia, and what are the investment opportunities? Gain insights from a GP that has successfully sourced, executed and managed project in Southeast Asia, as well as learn about the challenges and lessons learned along the way. Understand their justifications for investing in the region and their long-term strategy for the future. As demand for roads, railways, ports, airports, and other projects in Southeast Asia grows because of rapid urbanisation, transport infrastructure continues to attract interest. However, the largely uneven transportation infrastructure landscape, in addition to the complex governance systems of several countries, means that private investors are facing challenges that increase their investment risk. In this session, experts will not only discuss current and upcoming projects, but also how foreign and private investors can tap into these opportunities. How can private investors gain access to transportation projects, and what sort of partners can they work with to do so? Aside from roads and airport projects, what other sub sectors will become increasingly lucrative prospects for private investment? What are some of the transport investments that have made the best returns in Southeast Asia? How can PPPs be effectively used in transport infrastructure? As foreign investors become more comfortable with deploying capital to the region, the past few years have seen interest from Canadian pension funds entering the market and sovereign wealth funds exploring opportunities outside of developed countries. However, the Southeast Asian market is still considered to be a risky investment proposition compared to the United States and Europe. Finding the right partner for projects, sourcing quality deals, and tackling governance issues are just a few of the problems that institutional investors face. 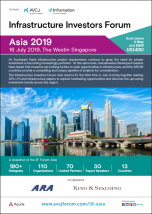 Join our panel of esteemed international investors to hear about some of the lessons learned when investing in Southeast Asia, as well as their long-term strategies for the region. Direct investments vs. fund investments vs. co-investments; which strategy do specific LPs implement and why? What are the main types of projects and sectors that LPs are looking at, and how are they gaining exposure in these areas? Are LPs investing in more established countries, frontier countries, or are they looking at Southeast Asia as a whole? What questions are LPs asking when it comes to driving operational value creation in infrastructure assets? In these interactive, country-specific roundtable discussions, each group will be joined by an investment expert to discuss the unique set of challenges and project pipelines each region has to offer. Designed to promote networking and discussion, the experts will share their experiences in sourcing, executing, and managing deals in their geography, and take a deep dive into what opportunities are on the horizon.